J.R. Obst and T.K. Kirk, Isolation of Lignin. J. Azuma and K. Tetsuo, Lignin-Carbohydrate Complexes from Various Sources. R.L. Crawford and D.L. Crawford, 14[C]Lignin-Labeled Lignocelluloses and 14C-Labeled Milled Wood Lignins: Preparation, Characterization, and Uses. B. Monties, Preparation of Dioxane Lignin Fractions by Acidolysis. D.L. Crawford and A.L. Pometto III, Acid-Precipitable Polymeric Lignin: Production and Analysis. K. Haider, H. Kern, and L. Ernst, Chemical Synthesis of Lignin Alcohols and Model Lignins Enriched with Carbon Isotopes. F. Nakatsubo, Synthesis of Lignols and Related Compounds. T.K. Kirk and G. Brunow, Synthetic 14C-Labeled Lignins. M.H. Gold, J.K. Glenn, and M. Alic, Use of Polymeric Dyes in Lignin Biodegradation Assays. R.L. Kelley, Ligninolytic Activity of Phanerochaete chrysosporium Measured as Ethylene Production from ~ga-Keto-~gg-Methlylthiolbutyric Acid. V. Huynh, R.L. Crawford, and A. Paszczynski, Assays for Extracellular Aromatic Methoxyl Cleaving Enzymes for the White-Rot Fungus Phanerochaete chysosporium. T.K. Kirk and J.R. Obst, Lignin Determination. M. Tanahashi and T. Higuchiv, Chemical Degradation Methods for Characterization of Lignin. C.-L. Chen, Characterization of Lignin by Oxidative Degradation: Use of Gas Chromatography-Mass Spectroscopy Technique. C.-L. Chen and D. Robert, Characterization of Lignin by 1H and 13C NMR Spectroscopy. A.L. Pometto III and D.L. Crawford, Gas-Liquid Chromatography of Aromatic Fragments from Lignin Degradation. A.L. Pometto, III and D.L. Crawford, High-Performance Liquid Chromatography of Aromatic Fragments from Lignin Degradation. W. Zimmermann, A. Paterson, and P. Broda, Conventional and High-Performance Size-Exclusion Chromatography of Graminaceous Lignin-Carbohydrate Complexes. T. Umezawa and T. Higuchi, Analysis of Lignin Degradation Intermediates by Thin-Layer Chromatography and Gas Chromatography/Mass Spectrometry. U. Raeder and P. Broda, Preparation and Characterization of DNA from Lignin-Degrading Fungi. R. Haylock and P. Broda, Preparation and Characteristics of mRNA from Ligninolytic Fungi. Y.-Z. Zhang and C.A. Reddy, Use of Synthetic Oligonucleotide Probes for Identifying Ligninase cDNA Clones. M. Tien and T.K. Kirk, Lignin Peroxidase of Phanerochaete Chrysosporium. D.L. Crawford and A.L. Pometto III, Lignin-Depolmerizing Activity of Streptomyces. M.H. Gold and J.K. Glenn, Peroxidase from Phanerochaete chrysosporium. A. Paszczynski, R.L. Crawford, and V.-B. Huynh, Manganese Peroxidase of Phanerochaete chrysosporium: Purification. J.A. Buswell and K.E. Eriksson, NADPH Dehydrogenase (Quinone) from Sporotrichum pulverulentum. J.A. Buswell and K.-E. Eriksson, Vanillate Hydroxylase from Sporotrichum pulverulentum. F.-H. Bernhardt, E. Bill, A.X. Trautwein, and H. Twilfer, 4-Methoxybenzoate Monooxygenase from Pseudomonas putida. J.A. Buswell and D.W. Ribbons, Vanillate O-Demethylase from Pseudomonas Species. E. Jaeger, Purification of Coniferyl Alcohol Dehydrogenase from Rhodococcus erythropolis. R.L. Kelley and A. Reddy, Glucose Oxidase of Phanerochaete chrysosporium. J. Volc and K.-E. Eriksson, Pyranose 2-Oxidase from Phanerochaete chrysosporium. K.-E. Eriksson and A. Nishida, Methanol Oxidase of Phanerochaete chrysosporium. A. Collmer, J.L. Ried, and M.S. Mount, Assay Methods for Pectic Enzymes. T. Sakai, Protopectinase from Yeasts and Yeastlike Fungus. D. Pitt, Pectin Lyase from Phoma medicaginis var. pinodella. H. Fvrster, Pectinesterases from Phytophthora infestans. K. Tagawa and A. Kaji, Polygalacturonase from Corticium rolfsii. A. Schejter and L. Marcus, Isozymes of Pectinesterase and Polygalacturonase from Botrytis cinerea Pers. H. Konno, Galacturan 1,4-~ga-Galacturonidase from Carrot Daucus carota and Liverwort Marchantia polumorpha. H. Konno, Endopectate Lyase from Erwinia aroideae. O. Mikes, High-Performance Liquid Chromatography of Pectic Enzymes. P.R. Austin, Chitin Solutions and Purification of Chitin. S. Hirano, Water-Soluble Glycol Chitin and Carboxymethylchitin. K.B. Hicks, Isolation of Oligomeric Fragments of Chitin by Preparative High-Performance Liquid Chromatography. K. Shimahara and Y. Takiguchi, Preparation of Crustacean Chitin. E. Cabib, Assay for Chitinase Using Tritiated Chitin. A. Ohtakara, Viscosimetric Assay for Chitinase. T. Boller and F. Mauch, Colorimetric Assay for Chitinase. J. Blackwell, Physical Methods for the Determination of Chitin Structure and Conformation. D.H. Davies and E.R. Hayes, Determination of the Degree of Acetylation of Chitin and Chitosan. A.C.M. Wu, Determination of Molecular Weight Distribution of Chitosan by High-Performance Liquid Chromatography. A. Ohtakara and M. Mitsutomi, Analysis of Chitooligosaccharides and Reduced Chitooligosaccharides by High-Performance Liquid Chromatography. E. Cabib and A. Sburlati, Enzymatic Determination of Chitin. E. Cabib, Chitinase from Serratia marcescens. A. Ohtakara and A. Arroyo-Begovich, Chitinase from Neurospora crassa. G.F. Pegg, Chitinase from Verticillium albo-atrum. T. Boller, A. Gehri, F. Mauch, and U. Vvgeli, Chitinase from Phaseolus vulgaris Leaves. G.F. Pegg, Chitinase from Tomato Lycopersicon esculentum. J.P. Zikakis and J.E. Castle, Chitinase-Chitobiase from Soybean Seeds and Puffballs. E. Cabib, Endochitinase from Wheat Germ. Y. Uchida and A. Ohtakara, Chitosanase from Bacillus species. A. Ohtakara, Chitosanase from Streptomyces griseus. Y. Araki and E. Ito, Chitin Deacetylase. Y. Araki and E. Ito, Poly(N-acetylgalactosamine) Deacetylase. H. Kauss and B. Bauch, Chitin Deacetylase from Colletotrichum lindemuthianum. R.W. Soto Gil, L.C. Childers, W.H. Huisman, A.S. Dahms, M. Jannatipour, F. Hedjran, and J.W. Zyskind, N,N*b7-Diacetylchitobiase of Vibrio harveyi. Author Index. Subject Index. 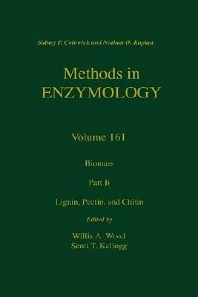 The critically acclaimed laboratory standard, Methods in Enzymology, is one of the most highly respected publications in the field of biochemistry. Since 1955, each volume has been eagerly awaited, frequently consulted, and praised by researchers and reviewers alike. The series contains much material still relevant today - truly an essential publication for researchers in all fields of life sciences. Biochemists, enzymologists, analytical, physical, and organic chemists, chemical engineers (fuels, energy, food processing), industrial and applied chemists, microbiologists. Michigan State University, East Lansing, U.S.A.
Salk Institute Biotechnology/Industrial Associates, Inc., San Diego, California, U.S.A.
California Institute of Technology, Division of Biology, Pasadena, U.S.A.